The Remembrance (or Communion) is the first and most important church service of the week. 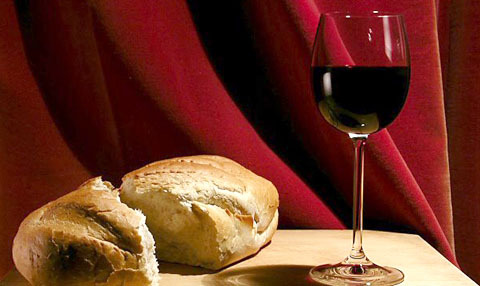 The taking of bread and wine is done at the direct command of Jesus given at the 'last supper' in Jerusalem. After Jesus and His disciples had kept the annual Passover feast just before He was crucified, Jesus went on to do something His disciples had not seen before. He took a loaf of bread and gave thanks for it then broke it and passed it round to His disciples to share with Him. He indicated to them that this was an emblem of His body which was to be 'given' for them and that they should do the same in order to remember Him. He repeated this with wine, as an emblem of His blood which was to be shed for them. Although at that time they did not recognise the significance of what He had done, they remembered it later and did as He had said. Just like that occasion our Remembrance is a very simple service in which first bread and then wine is taken, broken or poured out after giving thanks for it and all it reminds us of. These emblems are shared by the church members. The rest of the service is taken up with prayers of thanksgiving and the singing of hymns. Anyone is welcome to attend and observe the service, but participation in the taking of the bread and wine and in the prayers is limited to Church members only.